Aunt Mo loves family reunions and loves talking about them. She is a dynamic and energetic speaker and her family reunion presentations include a PowerPoint presentation, game ideas, demonstrations and recipes. 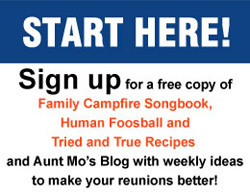 Aunt Mo is a great family reunion motivator and enthusiastically shares her ideas for a successful and memorable family reunion. Non-profit groups may book a family reunion presentation for no cost within a 60 mile radius of Aunt Mo’s home in Bear River City, Utah. Outside the area, costs for fuel and lodging, if necessary, are required. Aunt Mo will provide you with photos for promotion, biography and handouts for duplication. 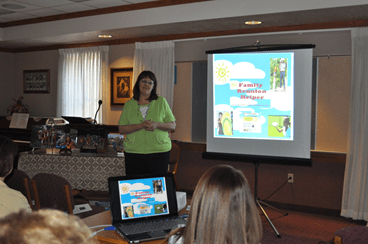 For church groups, Aunt Mo does not sell any products during her presentation but she encourages attendees to visit www.familyreunionhelper.com to download and print her free presentation materials.